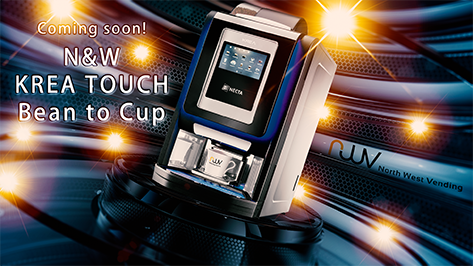 Coming soon and available to pre-order from North West Vending is the brand new N&W Krea Touch table top bean to cup coffee machine. 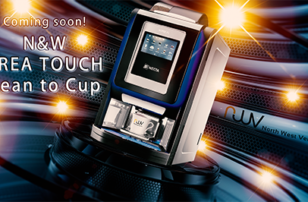 Building on the proven Krea offering, N&W global vending are about to launch a new touch screen version featuring its sophisticated Giga Touch technology, already successfully seen on the outstanding N&W 9100 table top bean to cup and the Canto Touch floor standing vending machine. The Krea Touch will offer consumers the ability to make barista quality drinks to just the way they like it, all at the touch of an easy to use on-screen menu. Compact dimensions mean the Krea Touch will easily fit into any small kitchenette or breakout area and yet provide drinks for up to one hundred people between ingredients refills. Cost wise, the Krea Touch will likely be as competitive as its non-touch screen sibling and a market leader for value and quality.